The small country of Lebanon offers ancient Phoenician, Greek, Roman, early Christian and Crusader monuments, the natural beauty of soaring, snow-dusted mountains contrasted against dark-green cedar forests and sparkling green valleys, mouthwatering food and excellent wines, and friendly, forward-looking people. It is a cultural gem waiting to be uncovered. Shaped by rich Phoenician history and later transformations under ancient Roman and then Ottoman rule, Lebanon is an ethnically diverse country with hundreds of historical monuments: from ancient settlements, Crusader castles, Catholic monasteries, historic mosques and palaces to sophisticated modern design and glitz of the cosmopolitan Beirut. It not only has gorgeous beaches and snow covered mountains, but also beautiful waterfalls, legendary cedar forests and fantastical limestone caves. All that is topped with amazing wines and flavorful cuisine with origins going back thousands of years. Although damaged by decades of invasions, interventions of nations, and a civil war, Lebanon remains magnificent with its majestic ancient ruins, mountain vistas, and hospitable people. 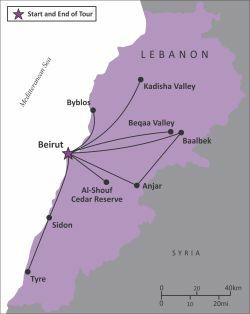 The Essential Lebanon tour is both a journey back in time and a dazzling glimpse of the future through the eyes of a modern Middle Eastern country. As we discover Beirut's artsy neighborhoods and its poignant history, enjoy its gorgeous Mediterranean coast, impressive modern architecture and sophisticated restaurants, we'll understand why Lebanon's capital is known as the "Paris of the Middle East". We'll visit the inspiring Roman ruins in Baalbek and the Umayyad town of Anjar in the Beqaa Valley, venture into the historically and visually imposing Kadisha Valley with its quaint Christian monasteries, Khalil Gibran museum, and the Cedars of God, travel down to the seaside castles and souks of the southern port cities Sidon and Tyre, we'll admire the Phoenician town of Byblos, enjoy Lebanese wines at several photogenic wineries, then live it up in the cosmopolitan Beirut. We'll relax at the beautiful beaches, take a boat along Beirut's coast, explore complex karst caves, tour Christian monasteries set in the famous Lebanese cedar forest, and indulge in the amazing Lebanese food and excellent local wines. Our journey through Lebanon will reward us with a feast for the senses and food for thought. All guides', drivers' and restaurants' gratuities throughout the tour. Additional/optional costs may include: optional single supplement, optional travel insurance, optional additional accommodations, early hotel check-in, optional tour director's gratuities, meals not included in the itinerary, activities not mentioned in the itinerary, telephone charges, room service, minibar, laundry, personal expenses, etc.